In Jonathan Park and The Journey Never Taken, the Polar Star Medallion mysteriously shows up at the Brenan Museum of Creation, quickly throwing the Creation Response Team into a scavenger hunt the world will never forget. “Live the adventure” with Jonathan and the Creation Response Team as cryptic clues sends the team to Sweden, Scotland, and beyond in search of a promised treasure. Along the way, uncover the true history of Charles Darwin and his colleagues and learn how these men helped perpetuate the myth of a universe created without a Creator. It’s another non-stop, faith-building, God-glorifying adventure with Jonathan Park! 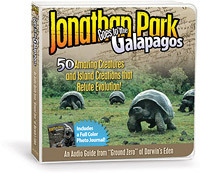 This year, as the world celebrates Charles Darwin’s 200th birthday and the 150th anniversary of Origin of the Species, use The Journey Never Taken to teach your family the real facts about Darwin, his mentors, and modern evolutionary science. Help them understand that evolutionary theory is a myth based upon man’s rebellious desire to supplant the Creator, and that the Genesis account of creation is God’s true and perfect revelation, daily revealed in His handiwork all around us. And, enjoy non-stop fun and adventure along the way with Jonathan Park and the Creation Response Team! NOTE: The Journey Never Taken CD album does not include a free companion study guide. There is no companion study guide for The Journey Never Taken. The Polar Star Medallion, awarded to Carl Linnaeus in 1758, mysteriously arrives at the Brenan Museum of Creation. Attached to the medallion is a puzzling clue that sends the Creation Response Team on an exciting scavenger hunt—beginning at Linnaeus’ home in Sweden! Meanwhile, the team is tailed by two unidentified men who will stop at nothing to get their hands on the medallion! The Creation Response Team members finds themselves tracking through the eerie Père-Lachaise Graveyard in France, as they continue to search for the Polar Star Treasure. Back in Boston, Benjamin Park leads the Junior Response Team to the top of the Old South Meeting House during a horrible storm that transports them back to a clue from the 1800s. This clue begins to unveil the identity of the unknown host of the hunt. And, crack reporter Trenton Wells and puzzle expert Mitch Hubbard, both of the London Harbinger Newspaper, join the competition to find the treasure! The clues seem to be taking the men of the Creation Response Team onboard the HMS Endevour—the vessel once piloted by Captain Cook. The voyage leads to an attack by modern-day pirates who kidnap the men and take them to the Isle of May to search for the treasure. During the midst of a pirate mutiny they realize they’ve made a grave error that may result in the treasure landing in the hands of Trenton and Mitch. With no ability to communicate, the men’s only hope is that the ladies of the CRT can unravel a clue found at Bartley Lodge—the childhood home of Charles Lyell! One of the most famous voyages of all time was Charles Darwin’s expedition to the Galapagos on the HMS Beagle. There was one more voyage, followed by a coast guard assignment, before the notorious vessel disappeared from history. That’s bad news for the Creation Response Team, who just discovered that the next clue in the Polar Star Scavenger Hunt is buried in its hull! They must beat Trenton and Mitch in a race to rediscover the Beagle! The latest clue lists four names — Miklos Lanick, Jiri Novak, Harvey Littleton, and Milton Puttock—that’s it. Who are these men, and when and where did they live? The Creation Response Team must decode the mystery behind each and find out what they have in common before the next clue will be revealed. But can they beat out their competition? It seems even less likely when Trenton and Mitch are joined by the CRT’s greatest nemesis! Legends of tunnels under the colleges of Cambridge, England have been told for years. Now, as the international Darwin celebration takes place in the city, the Creation Response Team discovers an underground world through an airlock beneath the River Cam. Every corner provides new challenges below as Benjamin and the Junior Response Team guide them from above. The world is watching as the teams wonder whether this secret passage may be the final resting place of the Polar Star Treasure! 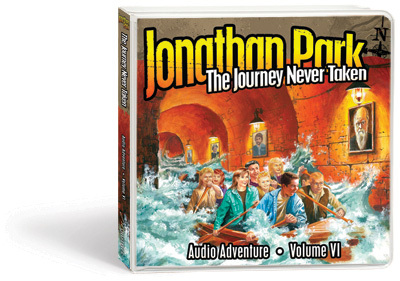 Hear a Jonathan Park Adventure Now!